Mr. Newburger opened the conference and stated that the subject of Aerial Phenomena was classified Secret within the meaning of AR 380-5 and comparable appropriate regulations of the Navy and Air Forces, and that all personnel at this meeting were properly cleared. Mr. Newburger then introduced Captain Neef, who briefly outlined the purpose of this meeting. 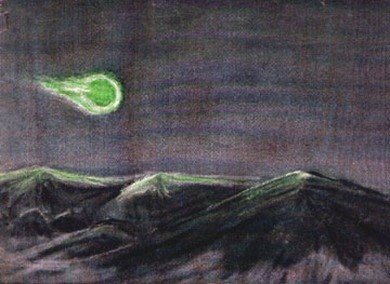 Captain Neef: It all started back in December, 1948, when we first received some reports from some airline pilots that these green fireballs were sighted. At this stage we had no idea what to do with it or what it was. We approached Dr. LaPaz who has been assisting us, gratis, since that date. Almost over two months now that he has been assisting us, so in order to have you get the facts as they are to a scientist, I’ll let Dr. LaPaz explain these things as we have found them. Then you can give us your opinion from there; that is what we are interested in. falling into the earth, is as you would expect, one at random – in azimuth and elevation. If the radiant white is known, you can predict the minimum angle with respect to the plane of the horizon at which the meteorite path has been observed. There is no choice, as far as the ….. for direction when meteorites fall in at random. I’d like to contrast now, at this time, this fact with what has been observed by some individuals here at the conference and by many of the AESS inspectors, UAL pilots, special agents, goodness knows how many other categories of people. I choose to describe the only one of the incident that I was personally a witness to. It is the only one of the incidents that I am in a position to vouch for on the basis of experience, dating from 1915, as a member of the American Meteor Society, was most certainly not a conventional meteorite fall. It was the so-called Starvation Peak incident on the night of December 12, 1948. Time of observation around 9:02 P.M., plus or minus 30 seconds. This fireball appeared in full intensity instantly – there was no increase in light. Its color, estimated to be somewhere around wave length 5200 engstroms, was a hue green, or yellow green, such as I had never observed in meteor falls before. The path was as nearly horizontal as one could determine by visual observation. We have a photograph which might be some liters of departure from horizontal. The trajectory was traverse at, I am inclined to believe, constant angular velocity. Just before the end of the path there was the very slightest drooping of the path, that is the green fireball broke into fragments, still bright green. Dr. Teller: And all this time the intensity was approximately constant? Dr. LaPaz: All the time, as far as I could determine. The eye, of course, is admittedly a very crude photographer. Dr. Teller: How long did the phenomenon last? Dr. LaPaz: Almost exactly two seconds. We have in the reports here, I brought the complete file with me and would be glad to circulate them, duration measures in relation to all observations. Few of these, however, I believe, were determined under as favorable circumstances as the duration of the Starvation Peak incident. Possibly I should go back and review the situation a little bit . Because some report, issued by the AESS, would certainly suggest that I was primarily responsible for starting this whole matter. I am glad that Captain Neef corrected that impression. Actually, I was on an investigation in regard to the green fireball observed on the night of December 5th at the time the December 12th incident occurred. As a result I was keyed up; I was watching; I had a stop watch with me and a transit. We got into position and made measures, transit measures, on azimuths and elevation readings; that is, we made a duration check, certainly within not more than two or three minutes after the incident occurred. To that extent, I believe, it is possibly the best observed of any incident up to the time of the January 30th fall. Dr. Manley: How did you have time to use the transit? Dr. LaPaz: The transit was in the back of the car. The moment the car was parked at the side of the road, we yanked the transit out and set it up and began measurements. We were in motion at the time but we were able to get a very good check of what we observed at the time on the road near Starvation Peak. We had a clear view of the sky to the Northwest and the West, and the object was so low over the horizon it was possible to compare it not only to the stars with which I am familiar, but with respect to mountain peaks that were also visible. To continue, that duration was about two seconds. This is one of the puzzling things to the meteorists. I believe I do not exaggerate when I say that 90% of the duration determinations that have been made in the case of the green fireballs have given durations right in that vicinity. Whereas you take, say, 100 ordinary meteor observations you will find the widest diversions in durations. You could take the same lesson as observed by 100 people – possibly that’s a better example – and there would be wide variations in the estimates of duration. Dr. Manley: Did you correlate the azimuths with …..? have been reported to me, both before and after this December 12th occurrence, possess almost all the properties which I personally observed on the night of December 12th, I feel that in all probability they are not themselves conventional meteor falls. Now, the easy way out of this is to conjure up an unconventional type of …. meteorite, which comes in practically parallel to the surface of the earth and is somehow endowed with the property against the very great atmospheric resistance that is experienced on a level, it reserves nearly constant velocity over paths say of the order of 25 to over 100 miles, as in the case of the green fireball on January 30th. It should also have the property that it is a very remarkable hue of green, not heretofore observed, to my knowledge, in the case of any conventional meteor falls. And finally, and this possibly is the most implausible feature of all, that although it produces light visible at distances of the order of 400 miles, it doesn’t make a sound. In the case of the January 30th fall, due to the fact that there had been a large number of military personnel alerted, we were able to obtain observations within a minute after the fall occurred and pursued the investigation over a distance of 1,000 miles – in Texas mud primarily! – in some ten days’ time interviewing literally hundreds of people, we saw not one substantial account of noise produced by the meteorite fall. Dr. Teller: May I ask how many people have seen this one big meteorite? Dr. LaPaz: That is difficult to say, (record blank for short period)…… Finally, in the interrogation of such persons, we invariably interview them as individuals. We tried a family of 8 the first night, as Major Godsoe will recall, interviewing….and it became apparent at once that there was some sympathetic influence and we broke it off after I think the third or fourth observation and thereafter interviewed separately. If you were to search, however, the independent observations of those who were widely separated, possibly stations to the order of 100, there were probably 100 different stations reporting. Dr. Teller: What area did that cover? Dr. LaPaz: All of New Mexico, all the Western half of Texas. I have a map here with some indications of possibly the extent of that. Hoyt and Bradbury: Wasn’t that Sunday the 24th? Dr. LaPaz: No, it was definitely Sunday the 30th. The newspapers have very helpfully concealed most of the relevant facts relating to this fireball. First, they described it as a fireball, second, they …(record blank for few seconds). interferred [sic] with OSI and wasn’t able to do that this time. This is the field map and will give in various colors, dots and pencil dashes, etc. all of the observations obtained on the Texas search. Dr. Teller: All relate to one fall? as you see, of points of appearance is somewhere Southwest of Amarillo or South-southwest of Amarillo. The disappearance point is in the vicinity of Lubbock, Texas. At the time this was drawn, before I was able to make out the transit measures in the vicinity of Albuquerque, this was the best apparent path of the fireballs. These other ink lines are independent, made by other groups of observers working on the same problem. (record blank again for short time) This transit, unfortunately, had a needle with a bent piston and it was not discovered until much later that we were getting faulty records. Independently, I have re-determined, using the best equipment available at the University, the lines of sight at all points where the faulty transit had been used. I have plotted on this map only observations that I made personally or such observations as I have every reason to believe were made by experienced personnel, for example UAL flyers, who took the trouble to make measures, or possibly civil engineers. Dr. Teller: You mean these people right afterwards or shortly afterwards took an instrument and tried to measure it? Dr. Teller: This is the point where it disappeared? Dr. LaPaz: And normally, all you will get is the point where it disappears, because the average man is aware of the fact that when he is not warned, he makes a very inaccurate observation. Having been warned by the appearance of the fireball, his attention is fixed and he watches where it bursts, where it explodes, where it disappears. So I say this is a much better determination. This beginning point, although you notice the …. of line here, is reasonably satisfactory. Dr. Teller: Are these points here observers of the test, locations of those observations? family were not able to confirm his observation of noise and no one in the town, some 300 or 400 persons I think in all were estimated to have been visited, no one at all had heard a sound, so I think that Mike probably heard the same dynamite blast as had been reported by Miss Winson Didpasture – I didn’t take that name out of the funny papers, it actually exists. Neef here put on a pair of rubber boots and very thoroughly searched the pond without finding a meteorite. Even in that case there was no evidence of alarm by the animals. I believe with that summary, I’d better cease operations and have you ask questions. Question: How many observed falls? Dr. LaPaz: I’d like to classify those into three groups. I would say that there are ten instances that definitely merit the most serious consideration. They are strictly analogous to the green fireballs of the night of December 12. On top of that, there must be something of the order of twenty more which are so well reported, from Los Alamos for example, that although the green fireballs observed showed small …. the nature of the fireball …. many observations of observers who paid practically no attention to the sky at any other time in their lives and now when they see a really bright light, they report it. You will find a great many instances of bluish-white fireballs. In my opinion, those falling vertically and leaving trails, are simply ordinary shooting stars. Of high intensity, that is, what we call fireballs, a blue light, are not in any sense to be associated with the green lights. Those three categories then. Dr. LaPaz: In the case of the two green fireball paths, determined from Los Alamos observations, in one case the Starvation Peak incident, we have an East-West motion, and then also a motion exactly parallel to ….. In other words, these two real paths show, I think they are the only two of the first category that show any real departure from the ….. It is possible to explain that. It is quite evident that we have no case of assurance that both groups of observers, the observers at Starvation Peak and the observers at Los Alamos, saw the same point of ….. so that if we were to merely ask what are the limits within which such real paths might fall, it turns out that it might be as short as 12 miles instead of being 25 miles long, and in that case it would be directed almost directly to the North; it would come down very nearly within 2 degrees, 5 degrees say, of the North. In the case of the Texas observations, whereas I have indicated and the maps show, we have many observations by trained observers, motion is clearly almost directly North to South. I have been informed that there are reasons for regarding the ….. out here (ditch digger) … and you notice that this passes reasonably close to Lubbock. The same is true of the two earlier fireballs, those of December 12 and December 20. They both passed – one passed centrally over Los Alamos and the other six miles North of the center, but this would not be true ….. (ditch digger). One point that possibly should have been mentioned earlier is this: I was the more interested when Captain Neef came to my office and brought the December 5th incident to my mind because very much earlier I had been contacted first by … White, Director of Texas Observers, in regard to their remarkable green flare seen on January 1, 1948. Second, from a Dr. Pruitt, Director Northwestern Section, City Section, of the Meteor Society, I had been informed that earlier occurrences of bright green fireballs, not too far from the Hanford area. When Captain Neef came in with reports of green fireballs near Las Vegas and particularly when he disclosed that there was a Los Alamos near Las Vegas – the real Los Alamos – it had much interest. Dr. Holloway: Are there any reports of these from other installations, such as Troy, New York, or places like that? Dr. LaPaz: I raised that question and I know of no other cases. I mean to say the areas from which these reports come, as in one, for such evidence as ….., they do not relate to the green fireballs; they relate to the daylight occurrence of horizontal moving, bright white objects – some in Memphis, Tennessee in May, 1948 – that is not too far from Oak Ridge. They relate to the Hanford area so far as the Pruitt observations go, and to the observations that I’ve mentioned here in the Las Vegas-Los Alamos area ……. A very curious thing has come to light during these investigations. I published not long ago an article in Science Illustrated on the recovery of the ….. Town meteorite. The time that fall, February 18, 1948, the rumor got around somehow in Northern Kansas and Southern Kansas that it was a Russian bomb, and it was aimed at the geographical center of the United States which is not very far from ….. Apparently, a great many people gave credence to that rumor and were delighted when we finally recovered meteorites up there and proved it wasn’t anything but an ordinary meteorite fall. Incidentally, it did not have the characteristics of the green fireball we’re talking about here . There was an air transport pilot who made a most curious observation while flying near Cherbourg on January 16, 1946. His observation was the observation of a bouncing meteor. After what I’ve been telling you about the green fireballs, you probably think it not unreasonable that a meteorite should bounce but to the meteorlytical mind that seems very hard to swallow. The interest is that one of your own persons here at Los Alamos, one and confirmed at least in part by four other persons, saw one of the green fireballs come down and then glide off horizontally. The bouncing meteorite is manually explained by having it form, say sinusoidal motion lying in about the plane at which the observer was looking so that he first saw the high point of the curve or the peak. The next time it was at the peak, it was so far away that the altitude was very low, which will give you the appearance of a bouncing meteorite. I offer that as a possible explanation. Of course, he may have landed in Paris before he made the Cherbourg flight and then we should disregard the testimony entirely! Mr. Newburger: Dr. LaPaz, you mentioned, I believe, at one of our other meetings that they had compared the color of this with certain metals? burner. I checked with Dr. Regener on that and asked him if an alloy had been used, like, say, copper beryllium, if there would be any change in that hue, and he has assured me there would not. He said it would still give approximate appearance of beryllium copper ….. You will find in probably 1350 of the 1500 only the merest trace of copper occurrence. There are a few meteorites like ….. in South Dakota, where little veins of copper have been found, making up possibly .4 of 1%. Dr. Bradbury: Is this true of all meteorites? Dr. LaPaz: It’s true in any category. Even in the irons, the presence of copper is very hard to detect, very little. ….. (ditch digger). I don’t know whether you gentlemen could suggest an easy way to obtain green fireball spectra or not. Dr. Teller: What is the geographical solution of this? Dr. LaPaz: Another map would probably answer that best of all. Mr. Hoyt: I would have said approximately as far above the mountain as the floor of the valley was below the top of the mountain. I felt that would give me somewhere in the neighborhood of 20,000 feet or thereabouts. It was about 5 minutes to 6, on my way up here. I have a feeling that it had a downward path. I mean it was going South. Dr. LaPaz: But it was not strictly horizontal? Dr. LaPaz: We have some discrepancies in that regard. 95% of the observations indicate a very nearly horizontal path. One from Fort Worth, Texas, which was not made by ….. but measured by them, indicates an elevation of 6 degrees at the beginning and 2 1/2 to 3 degrees at the end. Mr. Hoyt: That’s what I would have said, but remember that the ridge would give you the sensation that it was taking a downward path. Duration – at the time I would say it was approximately 3 seconds. Comdr. Mandelkorn: How does the calculated velocity of these objects compare with the known velocity of meteorites? Dr. LaPaz: Apparently very much lower; that is, more than the ordinarily observed meteorite falls. First, to observe in the cast of an actual meteorite fall you have a relation of the velocity from the auricle of ….. atmosphere down to the impact velocity which may be very ….. but it isn’t fair to compare the velocity of the green fireballs to the impact velocity of …… (ditch digger and everyone talking at once)……. Not with the trajectory velocity of the meteorite which is the same as the velocity of the fragments that fall from the meteorite. After a meteorite ….. the fragments fall about like a bomb. Their resistance just about balances out the ….. and as a result, they come down with about the velocity of a falling bomb, a little less because they do not have the same ballistic coefficient. Dr. Bradbury: This is not an excluded ? direction like the …..? Dr. LaPaz: Due to the fact that they have a curve, and practically all times during which darkness is with us, why they tend to come in from that direction…. Dr. Bradbury: Would it be a shower? Dr. LaPaz: That was my first explanation, as a matter of fact. Geminate showers with a maximum of December 10 to December 12. The first evidence that I had was Sgt. Kinsley’s report on December 2 and since often the forerunners of the showers will ….. I thought we were talking about Geminate showers except that I never observed a green Geminate. Matter of fact, a check of observations made at that time found that there were 414 observations since 1915 and there wasn’t a single one, Geminate or non-Geminate, for which any hue of green was mentioned. Later, for instance on the night of December 12, you could watch the Geminate come down…. and notice that they came in at high angles to the horizontal, whereas the green fireballs ….. Incidentally, we have another interesting piece of evidence there – Dr. Sherman Smith from the University – I mention an observation that he made on the same night. The time of the observation is in dispute. According to Dr. Smith it was probably as late as 10:50. He had to wait for a long time, he said, for his wife to pick him up after the concert was over. Mrs. Smith, however, times it around 10:10. Whatever the time, within an hour or say an hour and a half after the green fireball and the horizontal path were observed, we have another extremely bright blue fireball come out of the Geminate rays. I mention this because some of the first persons to concern themselves with this problem suggest that the green fireballs were simply abnormally bright Geminates. Apparently you can have very large Geminate falls of the color estimated by a trained …… checked with the spectrum charts ….. is quite distant, I assure you, from the green fireballs. Comdr. Mandelkorn: How good is the coverage of the observers of the American Meteor Society as far as the top-half of the United States is concerned? Dr. LaPaz: It depends a good deal upon overcast conditions. I would say, however, that this year the Eastern half of the country has offered phenomenal observing conditions. One of my reasons for withdrawing from Ohio State was that after 13 years there I had given up hope of ever seeing a meteorite shower because during the season of maximum intensity of the falls we had heavy overcast, snow and so forth. On the other hand, this year they’ve had reasonably open skies. I have obtained no reports from people in that part of the country. We thought we had a definitive check because Harvard College has now installed a photographic meteor station near or possibly inside the White Sands Proving Ground. Since the 12th of December, you correct me if I exaggerate here, we have been trying to determine the color and other characteristics of the ten or 12 brightest meteors observed at that station. We still don’t know what they saw. We know they were operating and they made some photographs, but Captain Neef can probably tell you the red-tape channelization impediments that has dropped out any determinations better than I can. Captain Neef: Well, it’s one of these things; it’s a Navy contract and they are not at liberty to divulge what they find, so we have to go through Washington, the Bureau of Ordnance, to get the information. Comdr. Mandelkorn: I believe I can get that information; as a matter of fact, I feel very certain that I can. Just a matter of approach. Dr. LaPaz: I feel certain if I had contacted Dr. Fred Whipple, for example, I could have obtained it, but his other occupations keep him away from that installation. And actually I felt as a meteorist, it might be wise to have OSI appeal for information rather than to ask for it directly. Captain Neef: They did tell us they weren’t usings films which were going to be susceptible to these colors. Dr. LaPaz: But, of course, they are making constant visual observations and if you were able to determine visual observations 100 miles from Los Alamos don’t reveal the occurrence of bright green fireballs, I think it would be significant. I don’t know why they should avoid the Southern-half of the State. Comdr. Mandelkorn: Let us say if these had been at extremely high altitudes, they would have been visible from White Sands without any question. Captain Neef: This one of the 30th definitely was visible from White Sands because Commander Holloman ? and his wife and one of his assistants and his wife saw it from there. Dr. LaPaz: On the other hand, you have evidence like that of Professor Talbot ? now in charge of the optical trajectory section down there, an experienced astronomer, a member of the American Meteor Society. I talked with him about this, and he has observed nothing out of the ordinary. I don’t think anybody, I mean in the line of green fireballs, in this area has been observing as much as he does. I don’t see how he could miss sighting some of these. Question: What explanation do you have for this? Dr. LaPaz: The only explanation is the one I gave in the beginning and had my ears promptly boxed for. I think these are defensive manoevers of some higher U. S. Command and they are practicing in the neighborhood of the regions they are going to defend, so naturally your localization of light near the atomic bomb installations, but boy, am I scolded for that! Even Dr. Kaplan of the FAD ? tells me no, no, the FAD would know all about it, and they don’t have any facts. Dr. Bradbury: Is this the physicist Kaplan? to the University of New Mexico, where he was lecturing, we called a conference with Major Godsoe and other interested parties. He gave a brief resume of the observations that had been made to date. Now, Kaplan is one of the charter members of the American Meteor Society, and he said certainly these could not be conventional meteorite falls. He, of course, mentioned as other people do who have not gone into it more thoroughly, the possibility of abnormal types of meteorite falls, that might come in from a peculiar direction or might droop at very low level, but I don’t think he was able to explain the absence of sound. Dr. Teller: Did I understand you correctly that the velocity of the object appears to be some 50 kilometers per second? Dr. LaPaz: No. In the case of the green fireballs something between 3 miles per second and 12 miles per second. Depending, you see, if you choose one ruled map or another. For example, let me illustrate how that affects the velocity determination. This is the one I think possibly best represents the observations of the case of the fireball of December 12. That is the path I assume the Los Alamos observers saw the same point of the curves that the Starvation Peak observers did, likewise to the point of disappearance. If we deny that possibility, the path might shorten to this dotted line (Dr. LaPaz worked on maps with Dr. Teller, explaining paths.) Dropping from 25 to something between 11 and 12 miles. The January 30 observation gave us our first long path. Dr. Teller: How long was it? Dr. LaPaz: The first observations we had here indicated ….. That was because of errors in the determination of the azimuth at the point of beginning, made due to the faulty transit they used. But that’s correct that the path runs over 100 miles. Dr. Teller: And how long does it take? Dr. LaPaz: Duration estimates range from 5 to around 14 seconds. I think that a 10 second average is about the best, that would give about 10 miles per second. Dr. Bradbury: Green is not an unknown color in meteors? Dr. LaPaz: If I were to rewrite the report that I first presented on that subject instead of saying “rarely observed” this color green, I think I would now say “never observed”. You sometimes see green, Dr. Bradbury, but it is a blue-green. The blue-green color is rare, but it is observed. For instance, Dr. Sherman Smith’s observation was essentially a blue-green, but on the blue side. Dr. Bradbury: What other colors do you see in meteors? Dr. LaPaz: Whites chiefly. If you look closely and without interference from outside lights, yellows, oranges and reds. Dr. Bradbury: But it’s apparently a yellowish-green we’re talking about here. If you can see a bluish-green, you can also see yellows and whites. Dr. LaPaz: There is some defect, possibly in the vision, that requires a pretty high intensity in that yellow-green before it’s noted in a meteor fall. Dr. Bradbury: Looks like green? Dr. LaPaz: Yes it does, that’s perfectly true. Now here’s a peculiar property of those yellow-green fireballs – some people will refer to them as red. The only explanation that I can think of is they report afterwards that they see what is an exposure to a very green-bluish light rather than the light itself – I don’t know if that is correct. And, incidentally, due to your observation, I don’t know how to explain the inability of meteor observers to report this renegade color, but I simply know it doesn’t occur. You go through long lists, like those of the American Meteor Society, you will find, I imagine, not 1 in 100 where a green is mentioned. Even in the case of the ? showers, where you have large numbers of very bright colors – let me recall something that all of you must have seen. The ….. shower of October 9, 1946 – anyone here who saw that? There were large numbers of extremely bright fireballs at that time. Kaplan himself recalled that they were blue, maybe blue-green, but never yellow-green. And I observed those under very favorable circumstances – we were flying at about 20,000 feet in a B-29. We had no absorption effects at all. They definitely did not show hues of green. Dr. Bradbury: You mentioned the noise problem also. The noise occurs only when the meteor itself blows up, breaks up? Dr. LaPaz: No, that isn’t strictly true. You have, in addition to the hollow sound, the normal sound of the breakup of the ….. You have headwind; you’re near the path. You get a real shock; for instance, we have ….. apparently broken up by that headwave, shock wave, in the case of the Norden County Falls. And then from the turbulence and reflections all the way along the path, you will have a rumbling which may endure not for the matter of a tenth of a second, but for minutes, and they’re real rough. Dr. Bradbury: But those occur fairly close to the trajectory? Dr. LaPaz: No. In the case of the Norden County Falls again, they were heard clear down to ….. City. Shakes buildings that far away. The ….. Falls were heard up to 300 miles from the point of impact. Dr. LaPaz: No, there again I checked very carefully because I was concerned. I am trying desperately to give a logical explanation to the absence of sound. I have found in the literature only three cases where no detonations, no rumblings were reported. One of those is the Belgium observation in 1855 and I think should be discounted because meteorists hardly existed at that time. Some falls occurred and were not reported at all. The other two are reasonably recent observations – one in 1921 and one in 1922. They occurred, however, in the deep South where negroes, I think, were the only observers. Even there, the whizzing of the meteorites as they fall through the air, was reported. I know of no case of an actual meteorite where at least the whizzing of the falling body coming down through the air has not been reported. Dr. LaPaz: Meteorite falls, I believe that was the way you phrased it? In the case of a shooting star, of course, you never hear a thing because the entire mass is, very kindly, vaporized before it gets, say, within 50 miles of the earth……. Not only noises, but accompanied by such noises that persons or animals are really frightened out of their wits. For example, we have a beautiful case where 2 horses killed themselves – in the Norden County Falls – they may have been felled by meteorites, but I’m inclined to think that the noise frightened them until they dashed into a ditch …… Animals go crazy. Comdr. Mandelkorn: Do you think it unusual no fragments are found? Dr. LaPaz: I certainly do. And I think it unusual, not only in the case of the green fireballs, but in view of the fact that a great fall, like the ….. fall of October 30, 1947, where for the first time we detected a bit of the interest on the party of the military, there too we recovered nothing. October 30, 1947, about 4:48 in the afternoon there was, what appeared to be, a tremendous meteorite fall over the reservation area – the Four Corners Area. We got there within a very few hours, had excellent observations, went back time and again, exhausted ground search, CAP people in airplanes, we had a radio centered, we had radio controlled jeeps and a lot of people out walking around – not a trace. I can’t give you a color on that because …..
Comdr. Mandelkorn: Ordinarily, when phenomena of that nature occur, you are able to recover some material? Dr. LaPaz: Yes, some material is recovered almost always. If proper search is conducted. We have, by the way, very thorough air search conducted by Gill Field Corps of Intelligence Unit; Dr. Lansberg of the Research and Development Board, very kindly interested himself in the problem and the air searchers resulted not even in the discovery of a broken branch. The region is heavily forrested. If branches had been broken, I think they would have been detected. I haven’t classified that particular fall, however, with the green fireballs and for this reason: that left a train. Another thing which I might have mentioned – a normal meteorite fall ….. will produce a long enduring train visible by day and night. Luminous by night and by day, illuminated by the sun. In case of the irons, it will be very faint, but it’ll be there if you look for it. In the case of the Four Corners Fall, that train was observed and I’m inclined to believe that it might have been a conventional meteorite fall. In the case of the green fireballs, to my knowledge, no such train has been observed. That question is always asked of people – did you observe a long enduring train; their replies were always negative. Comdr. Mandelkorn: Then you would say there were 10 incidents which are analogous to the green fireballs, with reports checked by a sufficient number of independent observers, that there is no doubt whatsoever of their occurrence ? Dr. LaPaz: I believe two of those incidents I mentioned occurred before the 5th of December. A very remarkable one of the 4th of August – note that that again is very close to the time of ….. meteor shower …… From late in July on and my report will be producing quite a number of these ……., but it is physically impossible with this particular observation from near …… Oregon…..
Dr. Bradbury: Then their directions were wrong? Dr. LaPaz: As a matter of fact, we can’t tell because they were single observations. Maybe I should pass that letter around, but it is, I believe, the first detailed report on what might be characterized as a typical green fireball. After the Oscar ….. incident of January 1, 1948, was merely a remarkable green flash, which might have had some other interpretation. Major Godsoe: The basic purpose of this meeting is: we want you to find a meteor! Mr. Newburger: Have the military – anyone from the National Defense establishment – given us anything? Sent out any conjectures about this thing? Major Godsoe: No, most of the military authorities think we are crackpots; that is, except for the Army Air Force, which is taking an active interest in details. Mr. Newburger: The Air Force does have the primary interest in this gadget? Major Godsoe: Yes, the Air Force is the gathering, reporting agency for this phenomenon. Dr. Bradbury: None of us are experts in this field, so we essentially have to believe what we are told. I suppose if you try to look for logical explanations, there are probably some. Dr. Teller: As far as straightness of the path is concerned, if you have a meteorite that you have observed for 10 seconds, and in these 10 seconds it has gone a distance of 100 miles, it will have fallen in this distance 1/3 of a mile and now I should like to dare any observer to tell a curvature of this kind – because you are completely unprepared for the phenomenon. Dr. LaPaz: As is slows down, it curves toward the bottom. Dr. Teller: But apparently before it has happened, slowed down too much or exploded or something, and then it has disappeared. Now the…point is, of course, if it has no power it will slow down, but I do not know how quickly you would have to estimate that; furthermore, the rate at which it slows down will depend very much on the question whether it has been at a 10 mile altitude or a 20 mile altitude. Dr. LaPaz: The elevation estimates are very concordant on these, and I doubt that you will be able to change that elevation of 8 to 10 miles by very much. These are the real path observations that I have mentioned. Dr. Teller: Well, can you say…….do you think anything can be said about that? Dr. LaPaz: I doubt it. The eye, of course, is not a good speedometer. You can’t detect a change. At least, I did not in the one observation that I made and no such change has been reported. In the case of those who observed the green fireballs, say that near the end of the Texas fireball path of January 30 , it was noted that the fragments moved out leisurely to the point at which there was apparently less velocity, as shown by them on the green fireball itself. May I mention, however, that in the case of the normal meteorite fall that curvature in the path, the curvature itself, is one of the most apparent. You see that in the case of any large, ordinary detonation fireball fall even though it may not produce…there is a tendency to curve. Dr. Teller: What about total light…How does the brightness compare to the brightness of the meteorites that come from a meteor? Dr. LaPaz: In the case of the Texas Fall I can only base an estimate say on the comparisons that were made with the moon as to size and total intensity. In the case of the Texas Fall it would certainly comparable to – it was one of the brightest observed fireballs in total intensity …. In the case of the Starvation Peak Incident, we can compare it with Venus which was conveniently located, and it certainly was on stellar magnitude minus 4, possibly a little brighter. That comparison was made almost immediately after the observation…..
Mr. Hoyt: It was very bright and clear that night. …..
Dr. Teller: You saw it at 6 o’clock? Mr. Hoyt: At five minutes to six. Very, very clear that night. Dr. Manley: In 1945 or 1946 I observed practically the same thing as in this letter. We thought it was a roman candle. Definitely light green in color. I am still worried about the fact that they don’t report any green color in these falls. Dr. Bradbury: Lack of noise, lack of …., the lack of these things would be equally astounding for any material object. …..
Dr. LaPaz: Dr. Kaplan suggested the possibility of the same sort of phenomena that he could produce experimentally in his laboratory …. and he tells me under certain conditions he can produce a globe or lamps of yellowish-green light….. He conjectured for a minute that that might have some relation – an artificial aurora. Comdr. Mandelkorn: As long as you brought that up, Maj. Johnson has a letter I obtained from Gen. Bunker which may be pertinent. Gen. Bunker transmitted the information you’ve heard to the Air Materiel Command, and in reply received a letter from an Air Force General who recently returned from Alaska. I’ll let Dr. LaPaz read this. Dr. LaPaz: This is closely related to what I was talking about. It begins: “Dear Bunker: Received your interesting phenomena of 1 February and promptly turned it over to Howard… now saddled with the responsibility of clues. Regard as coincidental that on dates you mention Gen. Carroll was in Fairbanks, Alaska, and on his return related that he had never seen before in his life such a beautiful technical display of Northern Lights. Maybe what these people have seen is a reflection from the….. of these pyrotechnics. So far as we know, it is still phenomena and not material. Best Regards, Paul”. Dr. LaPaz: May I make the recommendation that if you look in the chapter by …… you’ll find that in Alaska where this observation was reported, there are very few times at this season of the year when you can’t see an aurora. Dr. Teller: I have the feeling that it is….either a discovery in physics, psychology or…..
Dr. LaPaz: I thought that psychological element would come in here! Dr. Teller: Here is a slightly irrelevant question – you brought in the flying discs. What is the connection? Dr. LaPaz: I didn’t bring in the flying discs. Mr. Newburger: I brought in the matter of the flying discs because the Air Force, as I understand, now have classed the flying discs and these fireballs into one category. Captain Neef: The only indication we have is a letter from MAC in Washington Saturday where they indicated the old project Sign is now project Grudge, which includes the phenomena observed in New Mexico. They knew of this meeting and were going to send a representative. Captain Neef: ….Change of direction such that we haven’t been able to follow it up yet. One of our men was returning Sunday night when our tower operator saw this object to the Southwest from Kirtland Field and….Arizona reported it was Southeast from them. From the Kirtland tower it was a bronze color. The time checks, but from…. Arizona it was green until it turned straight down and veered going…..
was there, but no motion. Now one who observes normal conventional fireball falls is aware of the fact that not 1 out of say 500 shows actual fixity; there is always motion. So, this looks very, very strange. Of course, you all know what those stationary fireballs turned out to be. They were the self-destructive devices on Japanese paper balloons operating. You had a hydrogen filled sphere with two-crown mask of magnesium flash-light powder. And when the magnesium and the hydrogen went off together, you could see it for a long way. We got stationary fireballs but they certainly were not meteoritic. My experience since I was suspected of psychological apparitions at the time I reported the stationary fireballs to, for example, Dr. Kaplan, my experience with….let me to be very cautious about taking my concern…..but at the same time I feel that we shouldn’t be too hasty in giving a natural explanation to these green fireballs. Dr. Teller: ….. but I would like to say, these phenomena are apparently quite bright, more luminous than normal meteorites? Dr. LaPaz: Well, the January 30th one was; I wouldn’t say that about the one I saw on December 12. That was a very bright fireball, but not extraordinarily so. Dr. Teller: What is the chance of getting pictures? Dr. LaPaz: I refer to the one attempt that was made on the night of December 19. We set up a photographic patrol – the AESS, as you probably know, has been interested in this problem. They brought a lot of speed graphics and so on and set them up. Mr. Maxwell, a member of the group …., and they were able I think the night before, to photograph a bright Geminate. But on the night of the 19th nothing was observed. The next night, however, the night of the 20th there was an incident which I believe might have been photographed, but by the time the equipment had been disbanded and nothing was obtained. I should think with proper coverage, say 10 to 15%, of these should record themselves providing you do not use green insensitive….and film such as the…. Dr. Teller: Is there any possibility of having a wide coverage of the sky triggered by a photo cell? Dr. LaPaz: I have discussed that, for example with Dr. Reneger, who has been very much interested in the apparatus, and his answer is more or less in the negative. 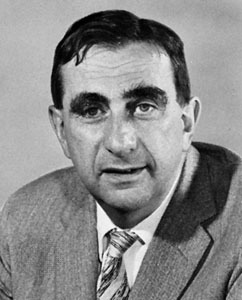 I understand that Cornell University – Gartline of Cornell – has produced some sort of photo-electric triggering device which has been used in this connection. I wrote him about it, asking for reprints or instructions, but never received a reply. Mr. Newburger: Does anybody know if there were any experiments carried out in Europe, prior to the war when our last best information came from over there, along this line? Dr. LaPaz: Not to my knowledge. I raised that question with Dr. Kaplan and he gave me some rather surprising information. Dr. Kaplan had attended the IAU meetings in Syria ? and the Russians had a large representation there. Sufficiently large, as a matter of fact, to beat down the proposal that the IAU appoint an international committee to investigate the so-called ….. meteorite crater produced in the fall of 1947, February 12. On the contrary, at the Oswald, I think it was, conference of the International Geophysical Union, none of the Russian geophysicists were present. Kaplan’s interpretation was that they feel so far ahead of us that they didn’t think they could learn anything, and they were taking the precaution that no leak occurred. Mr. Newburger: Were the Germans experimenting in any phase that was possibly connected with it? Dr. LaPaz: Well, they had the so-called stations in space…. might have some attachment to it. Comdr. Mandelkorn: You don’t have any record of experiments. Dr. LaPaz: No, no knowledge of experiments. ….. I have the belief that no country in the world has there been meteoritics developed as it has in Russia in recent years. Recently, the Academy of Science of the USSR has been issuing a so-called meteoritic, an extraordinary publication – very little work of the caliber being done by the Russians has been conducted in the United States. Apparently, there it has big support; here, it is an individual matter. Until we had some military interest in meteoritics, we were never able to found even an institute in meteoritics in the United States. The one in New Mexico is an outgrowth of application of meteoritics to determine, say, ballistic coefficients for shells of unconventional design like the proximity fuze shell with the radio in its nose, and that sort of thing. That’s where we got a start. Apparently the Russians got that earlier and have full-fledged state support. Dr. Holloway: How much interest would the military have if they found out these things were landing all over the country, Canada, Hawaii, etc. ?… Have you contacted people in the East? experiments. I think that if anyone of the UCLA Institute Geophysics had been observing, it would have gotten to Kaplan’s ears….. There are two great advantages to this area: first, you have clear skies at night and can observe them as they come down, and second, (record blank for minute or two). Dr. Holloway: ….. this was before the war. They had a telephone network which covered a fair section of the East there. ….. a network so that your observations ….. I mention this to indicate, I don’t know what he is doing now, but at least they may have a group of people who have been observing. May not be in a position to ….. green fireballs, but they might have seen them. Dr. LaPaz: My one attempt to contact ….. and unfortunately I did not approach him again for information, but someone acquainted with him should certainly ask if they have observed any of this sort of thing there. Comdr. Mandelkorn: Well, wouldn’t phenomena of this nature have been reported to the Society, no matter where they had occurred? Dr. LaPaz: Yes, I would think so. For example, you can consult the so-called meteor notes of the American Meteor Society, and popular astronomy, they are published from month to month with the President, C. C. Olivia, Director of the Florida Observatory at the University of Pennsylvania. I’ve been through those very carefully. There’s one single solitary case of a fireball which by one of the observers – a doubly observed fireball – so it was possible for me to …. in which one of the observers mentions a green color. Not this peculiar yellow-green which most people in that work find unusual, and in the case of them the elevation determined is of the order of, oh 199 kilometers from the beginning point and roughly 100 for the end, so I think it is only an ordinary fireball; nothing unusual about it. That was the only case I found. Comdr. Mandelkorn: According to recent records, were the observation conditions in other parts of the country satisfactory? At least part of the time? Dr. LaPaz: Well, I infer from the fact that we have had so much trouble out here and the East has been bragging about its climatic advantages, that probably during the recent months, they have had good observancy. I haven’t attempted a full scale check on that. Comdr. Mandelkorn: Let’s put it this way then: Have there been a sufficient number of fireballs reported in the last 60 days in other parts of the country to lead us to infer that had some of these occurred, they would have been reported? it was impossible to make an estimate of the approximate wave and engstroms without detailed spectroscopic equipment, which he did not possess. So whether the Captain actually cut out the spectrum charts and sent them to him or not, I don’t know, but it was considered. Dr. Bradbury: Well, we’re not coming up with any bright ideas for you very fast. Mr. Newburger: No, but as long as we have the problem presented to you, maybe by thinking on this, you will come up with an idea. ….. Of course, you know our entire connection which started with Madelyn Gwynn Merchant back in 1946! Dr. LaPaz: Except for the flying discs, nothing that you could say would cause me greater embarrassment! I have actually had communications from Madelyn myself. Dr. Teller: Your statement of the absence of sound when this thing has gone apparently overhead at the distance of 10 miles, within earshot of people. Dr. LaPaz: That seems incomprehensible, doesn’t it, Dr. Teller? I’m glad to hear you say that because that has been my feeling from the beginning. And we tried desperately to get confirming evidence whenever sounds were mentioned. No reports have been obtained. Dr. LaPaz: Kaplan told me he was going to get out one of his old blow pressure tubes and begin experimenting as soon as he returned from the UCLA, to see if he could duplicate in any way the descriptions we have given him. Dr. Holloway: What sound does a P-2 make when it goes overhead? Dr. LaPaz: I can tell you what they make when they come down. Comdr. Mandelkorn: I can tell you what they make when they go overhead at the height of about 1,000 yards. But anything man-made that passes overhead at the height of 8-10 miles, at this speed, could be inaudible. Dr. Teller: You think it could be? Comdr. Mandelkorn: I think it could be. The only. Dr. Teller: Even if it went at the speed of 10 miles per second? Dr. Teller: You see, at that time, the….begins to come up. Dr. LaPaz: You bet it does. Dr. LaPaz: I would like to ask a question. Isn’t it true in the case of the so-called light movement that you have very intense, luminous effects off them without noise? Comdr. Mandelkorn: From what Dr. Teller said apparently a solid object converging with the atmosphere horizontally at about 8 to 10 miles altitude, it’s incredible that it wouldn’t be accompanied by some sort of sonic phenomenon. Dr. Teller: I would like to repeat that to try to get an estimate of the size of the object, that it would have to have in order to get sound effects, is not an easy thing, but offhand I would say – this is what I would expect – that you get a very small object, as small as an inch or smaller. Dr. Teller: If I remember correctly, the intensity, the amount of energy that goes into a shock wave is proportional to the square of the velocity. The velocity that you have here proportional to the square of the velocity and, of course, is proportional I should think probably to the square of the linear dimensions of the object that you have. Now you have 10 miles per second… velocity of the object you have. Now you have 10 miles per second… velocity you have 20 miles per second, so this could be, on that count, ten times fainter – the sound would be ten times fainter. On the other hand, a meteorite that you will hear, I think,….. that much across…. Dr. LaPaz: The brightest meteorite fall in history, of which we have historical record, was the… fall in 1908, June 20 ….estimates the power of the light power, of that was of the order of 1018 – 1019 ergs per second. In the case of the Texas fall it was probably not 100,000th as bright. Dr. Teller: Now let’s try to get a check of this. Dr. Teller: If I can just believe everything I have heard and put it together with what I theoretically believe in, it ought to be a material body – might be an electron phenomenon. Dr. LaPaz: You see why I’m puzzled, Dr. Teller. Nothing like this, to my knowledge, has ever been observed in the case of meteorite drops. Dr. Teller: If you go to a group like UCLA or some other place where they have a good sound laboratory, they ought to be able to take the absence of sound observations – that is definitely incompatible, assuming that you know that there are … and assuming that they have heard no sound from this, they ought to be able to work an upper range upon the sight of the object which has been moving, and from these figures I would be inclined to believe the object could possibly not have a heat ? of something like 1 cubic centimeter. One centimeter in dimension, and that in turn would not have given the blinding effect, if it was a material object. Dr. Bradbury: Wait a minute, I think you’ve left out something in light effects – you don’t have to worry about kinetic energy. You can get your light from chemicals as well. Mr. Newburger: This seems to wind up the meeting. Dr. Bradbury: Still don’t feel that the meteor stuff is out. The puzzling thing is the long horizontal path; also, absence of noise is puzzling.